Saja is a passionate advocate for youth empowerment and communities of color. 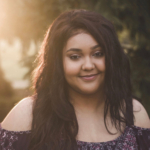 She is a Minnesota Youth Council member and student at Eden Prairie High School. A few weeks ago, I was stopped by a cop while walking to school. I was taking my usual route through the community center when I noticed his car driving towards me. He proceeded to watch me enter the facility. When I got to the end of the building, I noticed he had quickly pulled his car out from the main lot and into the back lot to meet me. He got out of his car and stood firmly, creating a wall with his body as I approached. I’d have to go through him to get to school. It was humiliating for him to stop and question only me while a couple of white kids were walking nearby. I was also disturbed by how hostile and aggressive he was. I was terrified—but didn’t want to say anything to push back or upset him, because he seemed very easy to provoke and I did not want to be the kid that got ______ on their way to school. The only thing running through my mind was, how could someone possibly feel so threatened by me? Just a week before this incident, in my new Intro to Social Justice class, we were told to take a picture of a place in the school with which we least identify. We had to sit in that place to journal for 15 minutes about why we feel that way. About 65 percent of the students at Eden Prairie High School are white. The rest are students of color. Some people might look at these numbers and think that the school is integrated. But the fact is that, on the inside, there is a wall, literal and figurative, between white students and students of color. Every morning and during passing time (the period in which we have to get to our next class), kids—mostly white, and all of whom are popular, rich, or on a varsity sport—stand at a railing called “the wall” in an area that overlooks the Old Commons. We call the students who hold the formation “wall kids.” As if their wall itself didn’t already send enough of a message, they also throw things like water bottles or cans at the students that sit below in the Old Commons. They stare at us like animals at a zoo exhibit, and create traffic that hinders us from getting to class. The wall makes me, and many other students, feel uncomfortable, so naturally, I went there for my assignment. When I arrived, I noticed two other white girls in my class already there, so I joined them to hear their thoughts. It didn’t take long for others from my class to arrive. When a group of Somali women made their way over to do the assignment, a white staff member approached them. He questioned them and other black students that came near the wall—and not the white kids who were holding the wall, and who hold it every single day. He accused the black students, not the white ones, of disrupting classes, even though the only thing next to the side of the wall where they were standing were the bathrooms. Because I was standing with my two white classmates, the staff member left me alone. I was invincible. It didn’t matter how loud groups of nearby white students were being, the staff member still chose to focus on the black students. He even chose to interrogate two black boys walking quietly down the hall, with a hall pass from their teacher in hand. How could someone possibly feel so threatened by them? Days later, when the cop let me go, I wish I could say that I was relieved. That I was excited to get to school so that I could be affirmed and supported by caring adults in a safe space. But I wasn’t. In fact, I felt so shaken, so anxious, and so unsafe that I had to stay home from school for a few days. The truth is that how that cop made me feel that day—different, humiliated, unwanted, like a threat—is how I, and other students of color, feel daily in school. We have to address the discrimination that students of color experience in, and even on the way to, school. We have to address the ways in which adults who are supposed to care for us willfully ignore, silently endorse, and actively perpetuate that discrimination. Until we do, these walls will never come down.